Adai Kozhakattai is a famous evening tiffin in Kerala Iyer families. And as always my patti used to make yummy kozhakattais. Day before yesterday, I made these adai kozhakattais for our dinner. While making it, I was literally thinking about my patti because, she used to grind the batter in the old fashioned stone grinder (Kall ural) and steam a whole lot of kozhakattais for 12 of us. 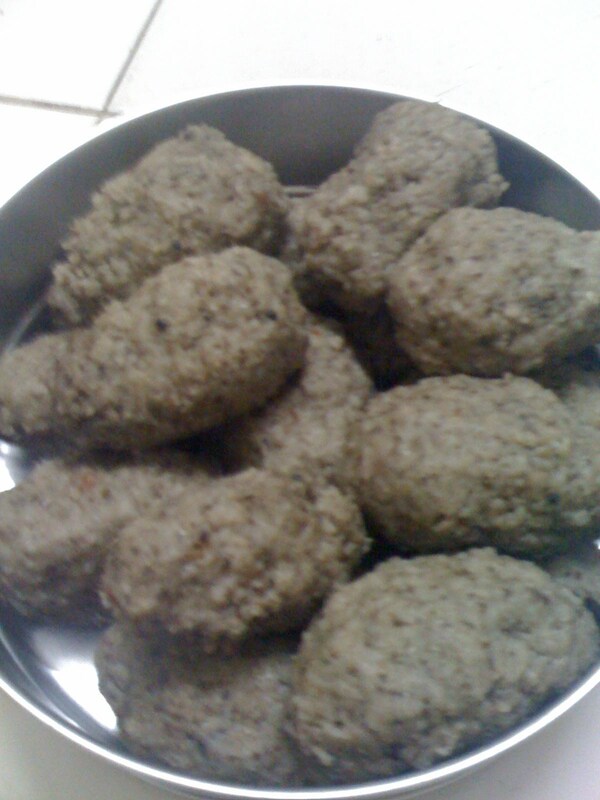 I wanted to eat this kozhakattai's during my masakkai time(6 years back), called my patti and asked for recipe. She gave the recipe and asked me not to strain myself because, we have to do lot of stirring (She had no idea about microwave and all). I soaked the ingredients and started grinding it. But that time, smell of the urad dhall made me throw up so badly and gave up the idea of making this kozhakattais and never had it after that. So wanted to give it a try this time. Since my patti is no more (and I already forgot the recipe), I called my chitti for the recipe and got it from her. Soak boiled rice, urad dhall, channa dhall and chillies for 4 to 5 hours. Grind it nicely adding curryleaves and required amount of salt. The batter should be like dosa batter. Take a pan, pre heat oil, splutter mustard seeds, fry urad dhall, red chillies and asafoetida powder and pour the adai batter in it. Stir it continuously till it becomes like a dough. I microwaved the batter for 10 minutes, stirring in between to get that consistency. If you touch the dough, it should not stick. Now make balls according to your wish and steam cook it for 10 to 12 minutes or till it becomes shiny, in idly moulds. Now adai kozhakattai is ready to eat. Coconut chutney goes well with it. When you are ready to eat, Just take couple of kozhakattais, scramble it, sprinkle a teaspoon of coconut oil and enjoy with chutney. I am sending this to Pari's Only Series, this time Only Low oil or Low Calorie hosting by Priya of Mharo Rajasthan Recipes. wow delicious kozhukkatai vidhya,healthy too...perfect entry for the event. Omg, wat an excellent and nutritious dish..never heard about this adai kozhukattai vidhya, thanks for sharing..
To date I have never tried these. Good you have mentioned them and I will grind the batter soon! I love adai and the kozhukkattai should be equally delicious.